The issue here is about styles. You think you're copying Arial 10pt text. Word thinks you're copying text in, say, Body Text style. When text is copied from one document to another, it retains direct formatting, but otherwise takes on the formatting of the style in the receiving document. Sometimes you copy text from one document to another, and the format of the text changes. This page explains why. in Word 2007 and Word 2010, Normal style is defined as Calibri, 11pt, aligned left, with 1.15 line spacing within the paragraph, and 10pts spacing after the paragraph. If you're having trouble copying text from Document 1 to Document 2, try doing it the other way round. Copy from Document 2 into Document 1. Depending on the work you're doing, that might be easier to manage. The issue is that Word doesn't think the formatting is changing, because Word doesn't think to itself "I'm copying some text in Times New Roman 12pt." It thinks "I'm copying text in style Normal" or "I'm copying text in style Body Text" or whatever. Unless you've chosen otherwise, all your text is in style Normal. So when you paste your text into the other document, it takes on the formatting of Normal style in that other document. If the Normal style in the other document is Arial 11pt, then that's how your text will appear. The text will, however, retain direct formatting. So if, in Document 1, you have some text in style Body Text and you've applied direct formatting to make the text orange, then, when you copy, the formatting will retain the Orange, but lose the characteristics the receiver document has defined as Body Text. In Word 2007 and Word 2010, formatting depends not only on Styles, but also on Themes. 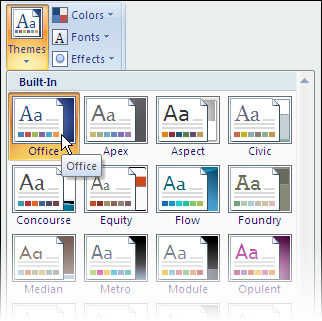 Every document has a Theme applied to it; by default, the "Office" theme. You can apply a theme from the Page Layout tab (Figure 1). When you copy and paste text with a font or colour applied as direct formatting, Word may not be thinking "I'm copying orange text". It may be thinking "I'm copying text in Accent 6 colour". Accent 6 may be orange in the donor document. But if Accent 6 is pink in the recipient document, the text will paste as pink. In Word 2007 and Word 2010, when you apply a font or a colour as direct formatting you have a choice: you can apply a font or colour from the document's Theme, or you can apply an "absolute" font or colour (Figure 2). If you apply a Theme colour or font, and then copy the text to another document, the colour or font will change to match the recipient document's theme. 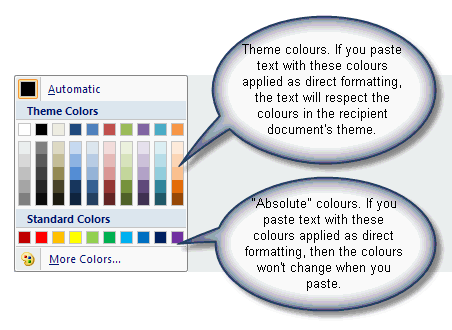 If you apply an "absolute" colour or font, and copy to another document, the text will retain its colour or font. If the donor document has a style that does not exist in the recipient document, then any text in that style copied to the recipient document will retain its formatting. So, to avoid text taking on the format of the styles in the recipient document, use styles with different names. In Word 2002 later versions, you also have the option of using the Paste Options buttons, although using them is by no means straight forward. In Word 2007 and Word 2010, to ensure that your text retains direct font or colour formatting, apply "absolute" fonts or colours (Figure 2). In some cases, you want incoming text to take on the styles in the recipient document. You want to abandon all current formatting: you just want the text. In Word 2003 and earlier versions: choose Edit > Copy in the usual way (or, use ctrl-c). When you come to paste, choose Edit > Paste Special then choose Unformatted text or Unformatted Unicode Text. In Word 2007 and later versions: choose Home > Copy in the usual way (or, use ctrl-c). When you come to paste, on the Home tab, in the Paste group, click the bottom half of the Paste button. Choose Paste Special, and then choose Unformatted text or Unformatted Unicode Text. (Note that the old Alt-E S keyboard shortcut still works in Word 2007 and Word 2010). This will paste only the text into your document. You will then have to format the text in the recipient document to suit your needs.